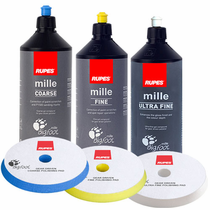 RUPES BigFoot Mille Compound Mix & Match Trio is ideal for all of your cutting, polishing and finishing needs. The RUPES BigFoot innovative gear driven system bridges the gap between the traditional rotary buffers and dual action polishers giving an advantageous time saving edge while safely maintaining the integrity of the paint. The RUPES BigFoot Mille Polishing Compounds were specifically formulated to work with the gear driven movement of the RUPES BigFoot Mille LK 900E Gear Driven Orbital Polisher and color coordinating RUPES BigFoot Gear Driven Mille Foam Pad for phenomenal results. 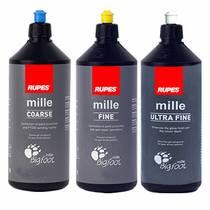 RUPES BigFoot Mille Coarse Polishing Compound was engineered to remove serious defects such as scratches and heavy swirl marks as well as other paint defects. It will even remove P1500 sanding marks. RUPES BigFoot Mille Fine Polishing Compound will remove defects such as fine scratches, swirl and other minor defects to enhance your paint's overall appearance. RUPES BigFoot Mille Ultra Fine Polishing Compound is your final finishing polish and was formulated to enhance your paint�s clarity as well as depth in shine and color.